The Cricket Ground at Lower Raleigh played host to a Duck Race and Car Boot sale on Sunday, organised by Barnstaple Pilot Gig Club as part of their fund-raising effort to establish a Watersports centre on Rolle’s Quay. It was a gloriously sunny day and, since no cricket was being played the event took place on the outfield around the cricket pitch. This was a particularly suitable venue since both the cricket club and the Pilot Gig Club have received considerable assistance from the Keith Noel Abrahams charitable trust in the past. The Duck Race was along a stretch of the River Yeo that skirts the boundary of the cricket fields. 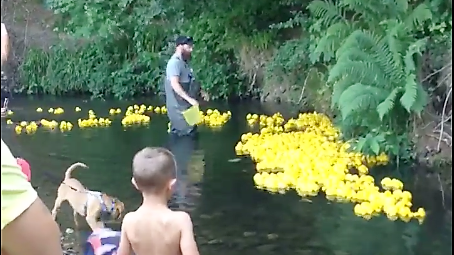 It began just after 12 noon when the barrel containing the ducks was upended into the river by two duck ‘herders’ wearing waders, who followed the flock of plastic ducks down the river to the finishing line. They intended to free any ducks tangled in the undergrowth, but were caught by surprise when some started to drift upstream, much to the amusement of the watching crowd. The recalcitrant ducks were herded in the right direction and followed down to the finishing line some thirty minutes later. This section had some deep pools which caught the ‘herders’ by surprise, but fortunately no one fell in. The winning ducks were greeted by cheers and loud applause as they were swept into the net by the increasing current. The day was an overall success for the Gig Club, raising in excess of £1100.00 towards their ‘Off the R’owd’ appeal from the sale of ducks, barbeque food and cake stall, and the Car Boot sale.